I’m back with another midweek pamper as I’ve added a couple of new products to my routine recently. I do love treating my skin a few times a week, especially when it’s looking a bit dull or congested (like it has been since the weather’s changed) so here’s what I’ve been using to get it back to normal. One of my favourite clay based masks has to be the Kiehl’s Rare Earth Pore Cleansing Masque. It’s great at drawing out impurities, but without leaving your skin dry like some clay masks can. I love how huge the tub is and how little you need to cover your face, as it makes it such a bargain purchase. I try to use this twice a week followed by the Jurlique Fruit Enzyme Exfoliator. I actually bought this thinking it was an overnight treatment, but instead it’s one you pop on for 10minutes to let it buff away any dead skin cells, revealing brighter and less congested skin. I really love the combination of the two, as they leave my skin looking more radiant and refreshed! 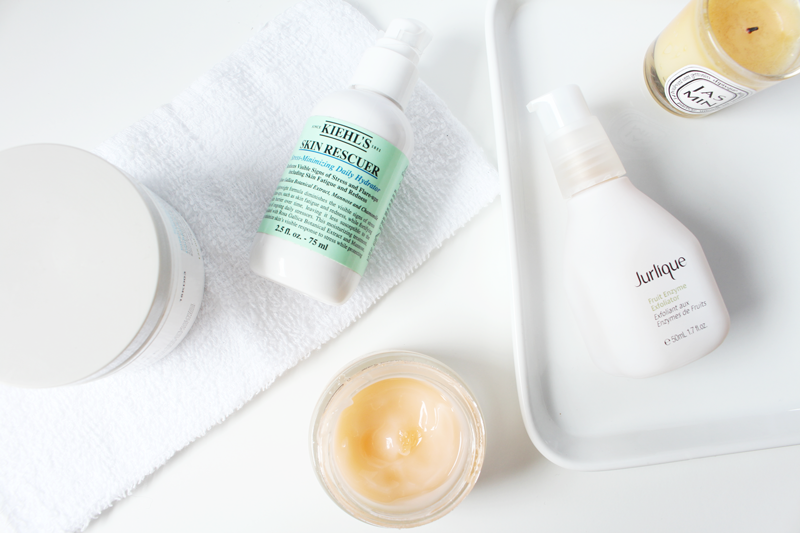 What have you been using this week to pamper your skin?